Here is the final piece of the Preparedness & Organization (ICS – Incident Command System) puzzle…Operations. It has taken me a long time to finally get this article written. The Operations Section was a tough one. The Logistics, Planning. and Admin/Finance sections were relatively easy to get onto paper. The Operations Section was a whole lot tougher. 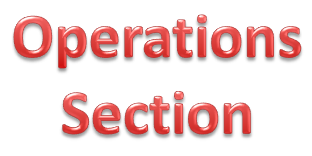 There is a fundamental difference between the church/religion implementation of the Operations Section and the prepper’s implementation of the Operations Section. The nice thing is the fact that they are compatible. And both are also 100% compatible with the current ICS system used by government and non-profit agencies that respond to emergencies and disasters as part of their day job. So what is that difference that I am referring to? When ICS is adopted and implemented by churches it is clearly and obviously associated with religious beliefs. And with rare exception religion is associated with compassion and service to others. And prepper groups would hopefully lump themselves into that same category of “service to others” during emergencies and disasters as well. 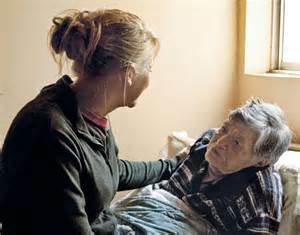 Voluntarily taking care of each other is a fundamental responsibility of the human race. 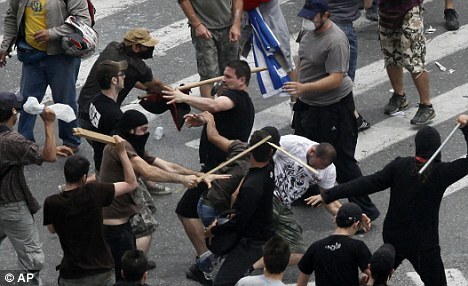 On the other hand, preppers will find themselves in a far different situation during a “grid-down” event. I think that most church emergency and disaster response organizations could easily find themselves falling apart when faced with a “grid-down” scenario. I think the very thing that makes churches effective spiritually, could work against them when times got tough, when even tougher decision would need to be made. I think preppers, especially organized prepper groups, would have no problem making tough choices and decisions. Hopefully without forgetting the compassionate side of their soul while doing so. So the fundamental difference is the ability to change from “offensive-service” to “defensive-protection” and then deciding to what degree the “protection” is implemented. With that difference in mind we end up with the same basic organization between the two groups and both are fully compatible with each other. And both are fully compatible with the standard implementation of ICS. It works out well, all the training and structural elements of both are familiar and useful to all. CICS – Church Incident Command System for use by churches, religious, or service-based organization. PICS – Prepper Incident Command System to be used by preppers individually, family, or any sized group of preppers as well. In a little bit I will split the next posts into two additional articles that mirror SICS/PICS implementations but for now I want to share a few concepts that will apply to both. These concepts are not new to ICS but I wanted to cover them and share a few things from my 30+ years of experience using it. First – Why do we need ICS, CICS, PICS or any other “system” when responding to emergencies or disasters? And especially why do we need something like this for a grid-down event? 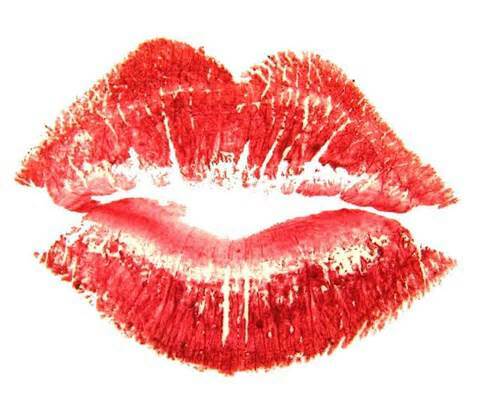 Those words bring more smiles, laughs, and other forms of cynicism than any other. We’ve all seen how badly government screws-up anything it touches, especially disaster and emergency response. 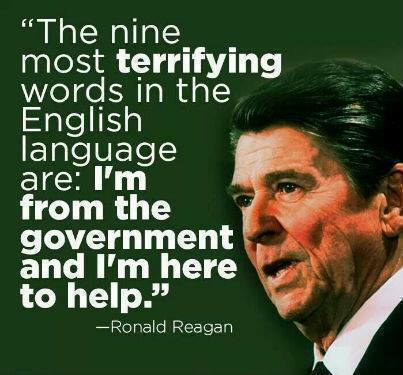 Often times government will make a disaster much worse than it already is. And will always make it very, very expensive. 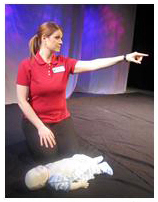 If you have had CPR training, especially if you have watched any of the CPR training videos, the person administering CPR will look at a person, point to them and tell them to call 911. Why not just yell for someone to call 911? Exactly, “someone” will rarely happen because everyone thinks that someone is not them. But when someone takes charge and organizes then tasks get done. Same thing for responding to emergencies, disasters, and especially “grid-down.” Organization is a primary key to being able to effectively respond to the challenges that you and your folks will face. ICS, SICS, and PICS will give you a ready-made answer and organizational structure. Next – Let’s remember what your goals are L.I.P.S. Life Safety : The #1 priority during any incident or event is life safety, protecting people from death or injury, in that order. Incident Stabilization : Don’t make an incident worse than it already is. The disaster is already bad, something has gone wrong; don’t do anything that will make it worse. Property Conservation : Don’t destroy anything you don’t have to. Don’t damage or destroy any resource (or potential resource) you don’t have to during a disaster or an emergency that you might need later. Societal Restoration : That’s a mouthful but you just want to put everything back the way it was (preferably better) before the disaster or emergency occurred. The concept is to return your family’s daily life to the original or a better condition as soon as it is reasonable to do so. Part of the “safety” aspect, both internal and external, is “accountability.” Not, in a negative sense where people are “held accountable” but rather in the positive sense that no one gets left behind, gets left out, forgotten, ignored, or not taken care of. There is accountability that people are taken care of; the answer to that is organizational structure. 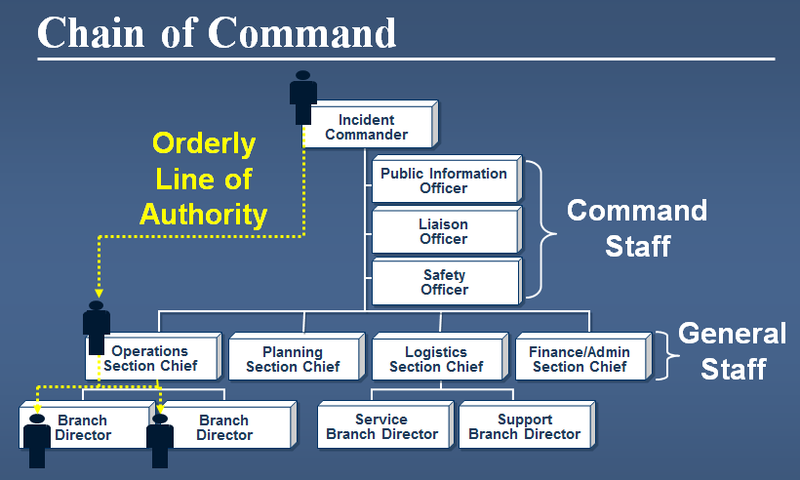 To ensure accountability we have chain of command where each person has a supervisor that they report to and receive information and tasking from. And only one person. This ensures that conflicting assignments and information are kept to a minimum, maybe eliminated. This means that all important communication goes up and down the chain of command. 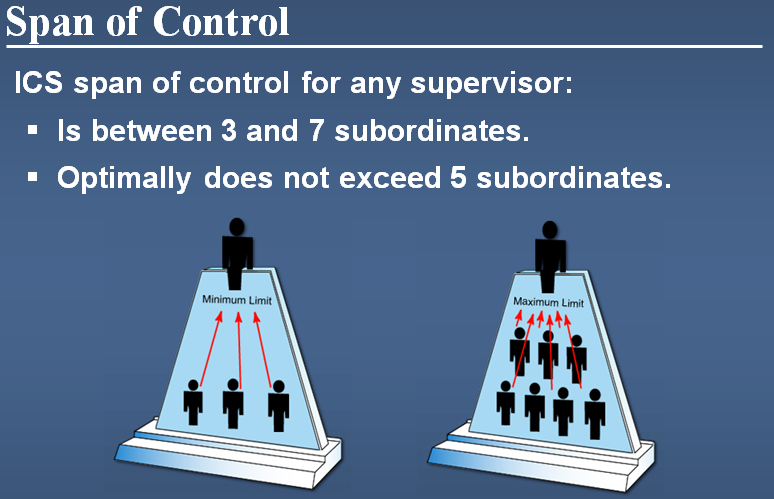 But this concept also means, that each supervisor has specific responsibility for the people that they supervise. The supervisor is responsible for the safety of their people, their health, their food, their sleep, etc. This ensures that everyone is being watched out for. No, this doesn’t eliminate personal responsibility for oneself, it enhances it. It makes sure that everyone is taken care of as best as possible. Another important principle that has proven to be true during emergency response and other stressful situations, span of control. Research and practical experience has show that the average supervisor/leader can only effectively supervise/direct 3 – 7 people at any one time. The more precise number that is used is 5 in the average emergency situation. Yes, a person can lead for that 7 people, but all research and practical experience shows that effectiveness drops significantly beyond 7 direct subordinates. And when you are talking about a drop in “effectiveness” in an emergency situation you are talking about increase in not just mistakes, but injuries as well…maybe worse. Span of control is the principle by which an organization grows or shrinks. You have up to five people working an emergency response, then you must have a supervisor. We will call that group of up to 6 people (including the supervisor) a “squad” supervised and lead by a squad leader. 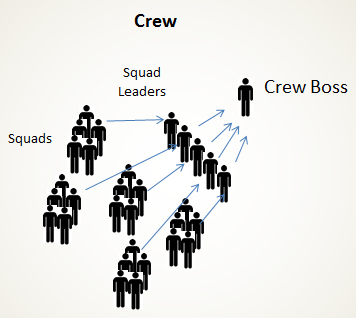 When you get more than 1 squad (up to 5) they form a “crew” supervised and lead by a crew boss. 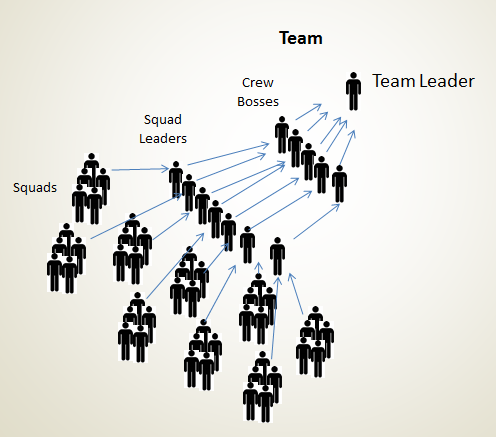 When you get more than 1 crew (up to 5) they form a “team” supervised and lead by a team leader. Now, let’s take a break from the span of control principle to look at two additional principles before returning and continuing to explain how span of control works. Notice how the organization is growing from the bottom up? We start at the lowest functional level, a single worker/responder. They are referred to as a resource. Then as the need for more people (resources) grows, or the needfor other skills grows, the operational organization grows with them. And that “need” is based on what function(s) are being performed. Form follows function. Function is based on need. The operational organization grows from the bottom up, NOT the top down. And the organization only grows when there is a need. We want to avoid the pitfalls of too many chiefs and not enough Indians. So a Division covers a specific geographic area of responsibility. A Group cover a specific skill set or function. A Group operates wherever they are needed at the request of a Division. So a Group may perform their work in any Division where they are needed. But when they are done with that specific work, they move out of that Division. 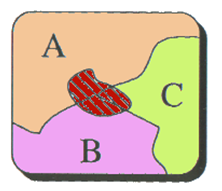 One last concept of Divisions and Groups – how they are named. There are two guiding principles of naming Divisions – horizontally and vertically. Don’t get confused or let it become over whelming. Look at a large Walmart parking lot with the building in the middle. We are going to place a Division in-charge of each side of the parking lot. Starting on the north side of the parking lot we name that division, Division A. The east side is Division B, the south side is Division C and the west side is Division D.
Notice how we started on the north end and then went around clock-wise naming the Divisions? First, it is consistency with the national naming convention. But it also makes travel much easier for people. If they are in Division A and are told to go to Division C to pick up drinking water, they know that they will travel clock-wise around a map, generally moving from north to south along the east side of the incident. OK, back to the Walmart…we have the parking lot properly assigned by Divisions. Notice that they are named alphabetically, clock-wise. But what about the Walmart building? For this discussion lets say that there are 3 levels or floors to the building. 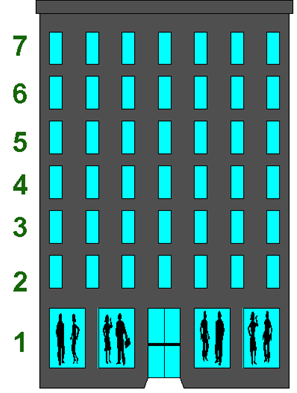 The first level/floor would be identified as “Division 1”, 2nd level/floor, “Division 2” and finally the third level/floor would be identified as “Division 3.” The divisions are identified vertically by numbers. So, if you were assigned to Division 2 and told to go to Division 3 to retrieve a tool you would instinctively know you would be going up one floor. The method Division assignments are made is simple and extremely logical. By doing so you automatically give people an understanding of where they are at an incident geographically speaking. And more importantly, where everyone else is or where they are going based on Division assignments. Groups are named by the function they perform. If I was referring to the EMT Group, instinctively who do you think I would be talking about? 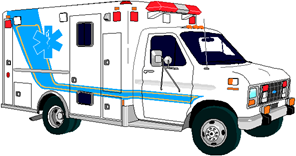 Yes, the people that are providing Emergency Medical Technician medical aid. Another example could be the Heavy Equipment Group what would you naturally think of? Yes, heavy equipment such as dozers, graders, trucks, etc. that would be available to provide earth-moving services. So why not assign EMT and heavy equipment to Divisions? Actually, you could. But would that Division keep them fully engaged, working, and busy all day, day after day? If the answer is “yes” then the EMTs or the heavy equipment could be assigned to a Division until their work is done. But, if the work needs to be take place in multiple Divisions but maybe only a partial day, or a two days at a time, it is more efficient to put them in a Group with a single supervisor and move them around the different Divisions as needed. When I get into each article specifically referring to CICS and PICS I will break it down into more exact examples. Now, back to the way an organization grows and develops…Remember where we left-off? 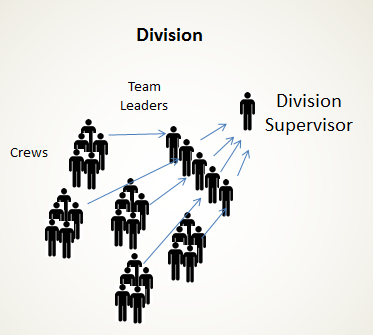 So, when you get more than 1 team (up to 5) they form a “division” or “group” supervised and lead by a supervisor. As I mentioned earlier, it is a division if it a geographic area. It is a group if it is a function. But they both look the same organizationally. 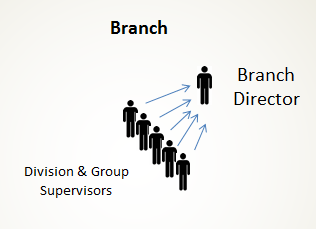 So, when you get more than 1 division or group (up to 5) they form a “branch” supervised and lead by a branch director. So, when you get more than 1 branch (up to 5) they form a “zone” supervised and lead by a director. 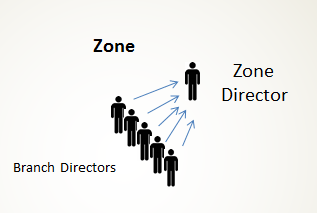 So, when you get more than 1 zone (up to 5) they form an “area” supervised and lead by a director. All Operations Section personnel are under the direction of the Operations Section Chief. 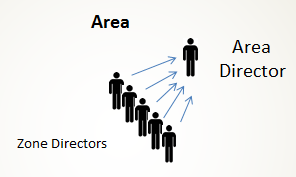 If you have multiple Zones a Deputy Operations Section Chief is assigned to supervise multiple Zone Directors. There is one strange part of the Operations Section that seems out of place at first, but is integral to the efficient and effective functioning of the Operations Section. There is a position called the Staging Area Manager. The STAM is in charge of, responsible for, the Staging Area. The Staging Area in a location where unassigned resources await an assignment. Those resources can be individual single resources, Squads, Crews, or Teams. When a resource is needed in a Division or Group, the Division or Group Supervisor contacts their immediate supervisor to make that happen. That need is communicated to the STAM who then dispatches the appropriate requested resources to the requesting Division or Group for a briefing and tasking. A STAM may have one or more Assistants to help them manage the Staging Area. Any resource that is in a Staging Area is ready and available for assignment. Minimal logistics are provide by the Staging area (i.e. water, port-a-potty, etc.). There are no limitations to the number of Staging Areas that can be put into use. If there is going to be more than 1 Staging area, a Staging Area Branch or Group can be set-up. Alternatively, one or more STAMs can be supervised directly by a Deputy Operations Section Chief. Otherwise, a SAM reports directly to the Operations Section Chief. But just remember, here are the approximate numbers you could be dealing with as various organizational levels. Decide how realistic it is for you to deal with any particular organizational situation. You can see how crazy the numbers can get. But that is also the beauty of the system as well. 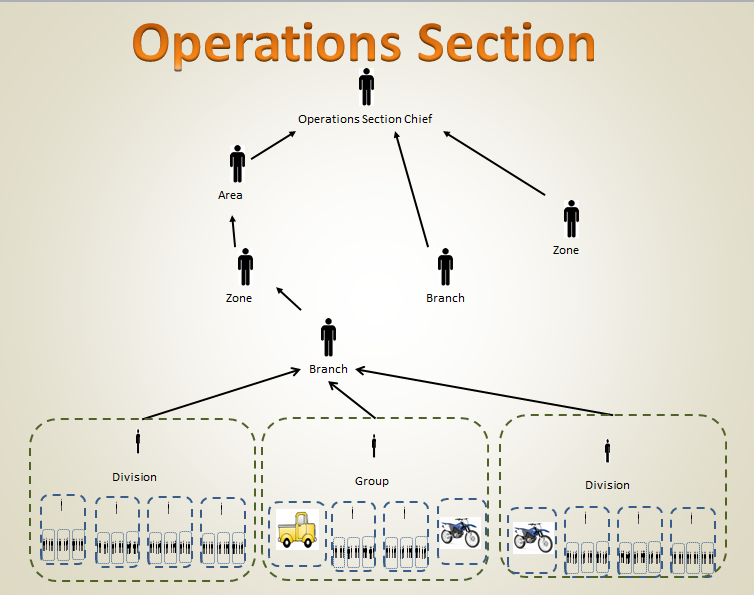 You have over 390,000 people in the Operations Section but no single person supervises more than 5 people. Amazing! And if you are wondering…yes, the system does work and it is used day in and day out, especially during wildfire season. I have personally been on incidents with over 5,000 people in a single command structure. And that was part of a larger fire organization of almost 10,000 people. I am telling you…it works, it very well.